The interior renovation of 2460 Pershing revitalized the iconic 1970s massive brutalist structure into a modern work environment that is a replicable model for transformative workplace design. Large windows expose views over Kansas City’s Crown Center commercial complex and landscaped grounds. 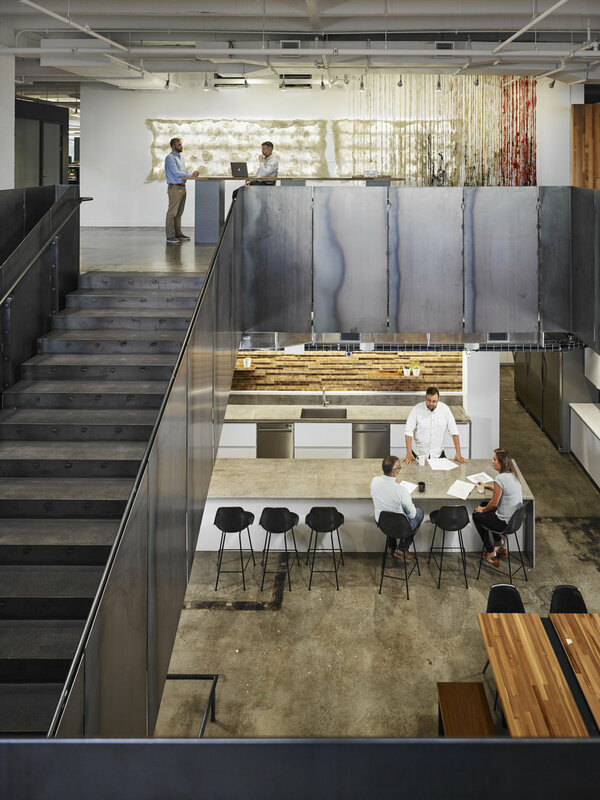 Workspaces were designed with collaboration and creativity in mind. A large central space spans two studio zones, where teams can meet and utilize various forms of technology to work collaboratively on projects. A total of 15 conference rooms provide spaces for all needs, from secluded areas to work individually to a maker space for prototyping and testing models under a variety of lighting conditions. Much of the renovation involved exposing the details and bones of the structure, integrating features of the building’s past in its new, modern form. The ceilings are open, revealing the HVAC systems and beams, and a polished concrete floor minimizes the environmental impact of installing new materials. These strategies align with Crown Center’s environmental commitment, including recent completion of 2015 goals achieving 39% energy reduction, 25% water reduction and 61% waste reduction.